This guide is intended for new installations of Microsoft Azure in an Azure Virtual Network (VNet). It does not cover migrating products to the cloud. The information outlined in this guide is applicable for all Orion Platform products that support cloud deployments. To reduce the number of places you have to configure your ports, SolarWinds recommends all cloud instances be in the same availability zone and in the same VNet. SolarWinds recommends using availability zones closest to your monitored devices. Your main Orion server and your Orion database server should be hosted at the same location, either both servers are on-premise or both are in the cloud. Hosting the main Orion server and database servers separately is not recommended due to connectivity concerns. Regardless of deployment location, it is important the main Orion server and Orion database are hosted on different servers. SolarWinds is not responsible for fees incurred when deploying SolarWinds products to the cloud. SolarWinds recommends this deployment when your monitored environment resides mostly in the cloud, and you have a good understanding of how much computer capacity you require to monitor your environment. Use this deployment type when the majority of your monitored networks are on-premise or if your hybrid environment is geographically diverse and use different availability zones. You can also deploy agents to your nodes in the cloud to reduce the amount of data transferred within the Virtual Machine instance - and from the Virtual Machine instance - to your main Orion server. You will need to create a virtual private network (VPN) tunnel between the Additional Polling Engine (APE) in the Azure VM instance and your main Orion and Orion database servers. This deployment is recommended when your monitored environment includes a significant number of on-premise devices, or if you are migrating your infrastructure to the cloud. These requirements use NPM licensing as a base for small, medium, and large deployments in Azure VM. * Azure Storage Disk volumes are not your dedicated hardware. Consider using Azure Reserved Instances of storage disk volumes for SQL servers. This checklist helps you prepare for Orion Platform product installations. Review product release notes and available documentation in our Success Center. The VMAN appliance is not supported in cloud deployments. Ensure your cloud instance has the required hardware and software specifications for your installed products. Certain products may require more or additional resources than the base cloud requirements. If you install multiple products, a good rule of thumb is to add one CPU core per additional product. For all port requirements, see Port Requirements for all SolarWinds products. Which components are you hosting in the cloud? Keep in mind the Azure pricing model and your estimated usage. If you intend to set up SolarWinds High Availability now or in the future, review the Enable High Availability section before setting up your cloud instances. The VNet and port requirements are different and may be difficult to change in the future. If you intend to deploy agents, review the Deploy Agents in the cloud section. Agents have additional port requirements. Review licenses and gather keys Review your product licenses and determine if you need to make any changes. You can download license keys for your new Orion Platform products through your Customer Portal. Verify any license upgrades and requirements with your SolarWinds account manager or contact SolarWinds. Gather credentials Make sure you have all account credentials, such as your SQL database credentials, your SolarWinds Customer Portal account, your Azure credentials, and Windows local admin server credentials. Set up the maintenance window, preferably during off-peak hours. Depending on the number of products, size of database(s), and size of environment, you may require multiple hours to complete your installation. Notify your company Send a message to your company of the upgrade schedule and maintenance window. If you need additional help, contact and allocate specific staff to be available. Depending on your licensed Orion Platform products, you may need to prepare multiple servers and configure ports in your firewall before installation. Prepare the cloud network (optional) SolarWinds recommends using a public DNS hostname and a public IPv4 address. 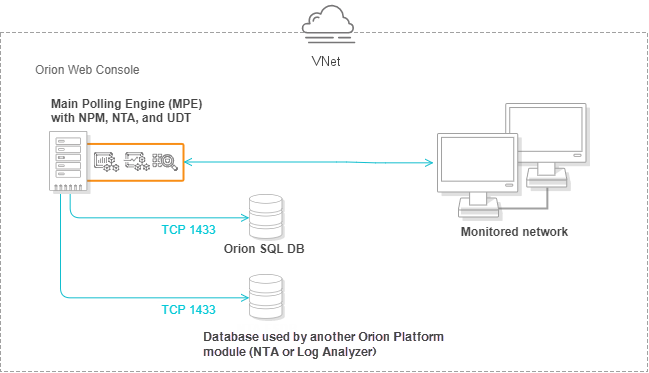 Create your VNet Create the VNet that will contain your SolarWinds Orion environment. Define the network security group for your Orion environment. All SolarWinds Orion components installed in the cloud, such as your main Orion server, Orion database, and APE, must be part of the same network security group. Define ports in the network security group. Modify port rules for the ports used by your SolarWinds products. For your server ports and firewall, open ports according to the port and feature requirements. Orion uses these ports to send and receive data, issue management commands, and perform additional actions depending on the features. For example, SolarWinds High Availability has additional port requirements beyond product needs. For more information, see Window Azure's help. If you set a public IP address, you may want to use stricter security settings, including strong passwords. Any server instance in the cloud must be part of the same security group. Orion server: based on your product deployment size and system requirements. Orion SQL server: based on your product deployment size and system requirements. Primary and Secondary servers for SolarWinds High Availability: review the HA requirements. Additional Polling Engine servers and additional web servers: see the SolarWinds Scalability Guidelines. NTA 4.4 requires an instance of SQL Server 2016 SP1 or later for a Flow Storage Database. NTA 4.4 SQL database cannot be hosted on Azure using SQL Managed Instance. NTA 4.4 requires memory-optimized data, which is not supported in Azure SQL Managed Instance. The Flow Storage Database can either be co-located with your Orion database on a single SQL server, or can be installed on a dedicated server. The deployment method is dependent on the size of your environment. NTA 4.3 requires a dedicated server for the Flow Storage Database with FastBit. Products with integration components, like DPA, require a separate database. Before installation, check for and run all Microsoft Windows Updates on all servers. If a Windows update automatically launches during installation, your system may restart if required by the update. The installation may not complete if your system is waiting to restart. Determine if any antivirus software is installed on the server or servers where you plan to install. To ensure the installation goes smoothly, exclude the SolarWinds directory. For example, on Windows Server 2012 R2, exclude C:\ProgramData\SolarWinds\. For a full list of antivirus exclusions, see Files and directories to exclude from antivirus scanning. SolarWinds assumes that C:\ is the default volume. Ensure that you can connect to your nodes from your cloud instance and vice versa. Polling Engines and Additional Web Servers must be able to connect to the database server. Carefully review the port requirements for your products. Incorrect ports can cause network communication and polling issues. See the Port requirements for all SolarWinds products for details. Review your DNS settings or your hosts file to ensure that you can resolve host names, including LDAP servers for user authentication, in your environment. Follow these instructions every time you run the SolarWinds Orion Installer. You can run the installer multiple times as needed to upgrade and install Orion Platform products. As you install products in an existing Orion Platform environment, you may also have options to upgrade products. Adding two or more virtual machines with the same name, even if they are assigned to different resource groups, can result in a timeout and error message when attempting to add or view an Azure instance. The auto-monitoring polling logic expects a unique machine name for each instance in Azure. To resolve, upgrade to SAM 6.6.1 on Orion Platform 2018.2. If you have products out of maintenance, the Orion Installer will provide the latest possible upgrades for your products. Information and a link will display warning you of the issues that can occur. Having even one product out of maintenance can restrict the upgrade options for products currently under maintenance. For example, if you have IPAM out of maintenance and want the latest NPM upgrade, you may not be able to upgrade until IPAM is also upgraded due to compatibility. Recommendation: Renew. SolarWinds highly recommends renewing your maintenanceto receive the latest upgrades and installs for all products. The Orion Installer will alert you to warning or critical level requirements issues during the System Check. Recommendation: Verify product requirements before you get started. View the checklist at the beginning of this guide for links to help. Follow these steps if you are hosting your Orion database server in the cloud. Sign in to your Azure VM console and launch an instance according to your recommended deployment size. Select the Security Group that contains all of your Orion servers. The SQL server must use the same timezone as your main Orion server. Sign in to your Azure VM console and launch a virtual machine according to your recommended deployment size. Select the Resource Group that contains all of your Orion servers. Use this instance for your Orion servers in the cloud. Save and run installer.exe on the server dedicated to your main Orion server. A welcome screen displays a list of products to install. The installer walks you through upgrading and installing in one process. Select the product(s) you want to install using the SolarWinds Orion Installer. (Optional) Select to Send usage metrics to help SolarWinds improve products. SolarWinds only receives data collected during the installation and upgrade process. Follow this step if you are hosting your NTA Flow Storage database in the cloud. Select the Security Group that will contain all of your Orion servers. Run the NTA database installer. If you are not hosting your NTA Flow Storage database in the cloud, run the NTA database installer on a physical server. Install the NTA Flow Storage database and the Orion database on separate SQL server instances. Hardware resources, including RAM, hard drive space, and number of CPUs. Software installed, including the Operating System version, .NET, and other required tools. Ports for data access and tasks. Specific checks for product configurations and additional requirements. Warning message: does not block the installation. Details provide recommended actions and best practices to update your environment for better performance. Critical issue: blocks the installation until resolved. Details provide required updates for your environment to support the products. After addressing the issues, run the installer again. For more information, select Click for more details. Click Save Install Report to save a list of issues to resolve. You can also click Copy the issue to clipboard to paste the details in a text file. The following is an example of a report. The EULA is displayed for you to review and accept. If you agree with the license agreement, click the accept option and click Next. Progress messages are displayed as products are installed. The installer displays any issues, halting the installation to allow you to review and fix. The installer may run multiple product installations prior to running the Configuration wizard. Installations requiring the configuration opens the wizard and walks you through the installation steps. You can always run the SolarWinds Orion Installer again to check for updates. 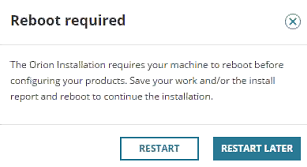 If a reboot is required as part of the installation, the installer will prompt you. You cannot continue the installation until you have restarted the computer. When the installation completes, the Configuration wizard opens. Depending on your product, the wizard may include additional options and screens. In the welcome dialog box, click Next. If prompted to stop services, click Yes. Authenticate as currently logged in user: pass through authentication to the SQL server using the account currently logged in for installing the Orion platform product. Switch user: provide separate SQL credentials. Unless you have joined your on-premise and cloud domains, you must use a dedicated SQL Server account. Windows authentication may not work as expected in the cloud. In the Database Settings dialog box, create a new database in your SQL server. SolarWinds recommends that your main Orion server and your SQL server are both hosted on-premise or in the cloud to prevent alerting loss or other undesirable behaviors in case of network connectivity issues. In the Database Account dialog box, create an account or use an existing account that the polling engine and Orion Web Console use to access the database. The account must be a SQL account. SolarWinds does not support creating a new SQL account through the Configuration wizard when the database is in the cloud. If you select Skip website binding, the Configuration wizard does not make changes within the website configuration in your IIS. This option blocks IP address, port, and SSL certificate options. Select All Unassigned unless your environment requires a specific IP address for the Orion Web Console. The Port is 80 by default. Specify the Port and the Website Root Directory where the system installs the Web Console files. If you specify any port other than 80, include that port in the URL used to access the Web Console. To configure SSL, click Enable HTTPS and select your SSL certificate. You must install your SSL certificate on the server before running the Configuration wizard. You can install the certificate and run the Configuration wizard again. If a certificate is not available, select the option to Generate Self-Signed Certificate. The Configuration wizard automatically generates a self-signed certificate issued to the hostname or FQDN and adds it to the trusted certificate store. If prompted to create a directory or website, click Yes. Review the list of services to install, click Next. Click Yes if prompted to disable the SNMP Trap Service and enable the SolarWinds Trap Service. In the Completing the Orion Configuration wizard dialog box, click Next. When completed, click Finish to launch the Orion Web Console. Open a web browser on your Orion server and enter http://ipAddress or http://hostname, where ipAddress is the IP address of your server and hostname is the host name of your server. SolarWinds recommends using a public DNS name or IPv4 address. Log in with user name admin and leave the password field blank. For security purposes, SolarWinds recommends that you change the password to your admin account. The Azure Active Directory is an access point that allows an external application or service, such as the Orion Platform, to connect to the Azure Portal. The Azure AD app must be configured to allow read-access to the Orion Platform for polling of VM status and metrics. See Integrating applications with Azure Active Directory for more information. Click Azure Active Directory > App Registrations > New application registration. In the Create pane, enter a Name for the AD app. Use a recognizable name, such as Orion, SAM, or SolarWinds. Select Web app/API as the Application type. Enter a properly formatted URL, such as https://documentation.solarwinds.com/en/Success_Center/. Click Create to display the AD app in the App registration pane. Click the Display Name of the new AD app to display registration details. Record the Application ID for use as the Client / Application ID in the Orion Web Console. The Application Key is used when adding an Azure account to the Orion Platform. Click All settings > Keys, to open the Keys pane. Enter a Description of the key. For the Duration, select Never expires. Click Save to display data in the Value field. The value that appears is the Application Secret Key. You next need to configure Identity and Access Management (IAM) permissions to integrate the Azure Active Directory app with the Orion Platform. Your account must be assigned to the User Access Administrator role to manage account permissions and perform actions, such as stopping polling. To configure your IAM permissions, see Configure Azure IAM permissions for cloud monitoring in the Orion Platform. Role-based Access Control (RBAC) may be customized for your organization and can affect how the Orion Platform works with Azure. If you are deploying Orion agents from the cloud to on-premise devices, follow the manual deployment steps. Otherwise, complete the steps below to deploy agents in the cloud. Update ports based on the agent communication type. The monitored device must be able to reach the Orion server using the IP address. Port 17778 must be open on the Orion server or APE. Open port 17791 on the monitored device if it runs on Windows 2008 R2. The Orion server must be able to reach the monitored device using the IP address. Port 17790 must be open on the monitored device. Open port 22 on Linux-based devices to install the agent. Open ports 135 and 445 on Windows devices to install the agent. You can manually deploy agents to a virtual machine using Remote Desktop Connection in two ways. Click Mass Deploy to Multiple Machines, and click Next. Download the MSI and MST files. Run a command prompt as administrator from the context menu. Log in to your Windows Azure account. Disclaimer: Please note, any content posted herein is provided as a suggestion or recommendation to you for your internal use. This is not part of the SolarWinds software or documentation that you purchased from SolarWinds, and the information set forth herein may come from third parties. Your organization should internally review and assess to what extent, if any, such custom scripts or recommendations will be incorporated into your environment. You elect to use third party content at your own risk, and you will be solely responsible for the incorporation of the same, if any. Create a PowerShell script to run on each virtual machine when it is launched for the first time, downloading and executing the MST and MSI files on each virtual machine where you want to install the agent. Log in to your Azure account. You can perform the following steps through the API or Azure CLI command line interface. Create an instance, and paste your PowerShell script under Advanced Details in the User Data text box. Select the As Text option. Stop the instance where you want to deploy the agent. Right-click the instance and click Instance Settings > View/Change User Data. Paste your PowerShell script in the text box as Plain Text. Under Node & Group Management > Manage Agents > Select Add Agent. Enter the name, IP address, secret, and port number for the agent and click Server-initiated communication. If you have Additional Polling Engines (APE) or an additional web servers (AWS), the final installation screen reminds you of those installations. SolarWinds recommends using the Scalability Engine Installer. If the DNS does not resolve the host names in Azure's VM, update your hosts file. On your main Orion server, add your APE or SolarWinds AWS information to your hosts file. On your APE or SolarWinds AWS, add your main Orion server to your hosts file. See Unable to resolve primary Orion server name for detailed troubleshooting instructions. Log in to the cloud instance for your Additional Polling Engine. Download this installer through the Orion Web Console. For the APE installer, click Settings > All Settings > Polling Engines. For the AWS installer, click Settings > All Settings > Web Console Settings. Run the installer on your APE or AWS. Repeat installing on all Additional Polling Engines and web servers in your environment. Azure does not support the use of a virtual IP address. As a result, Orion High Availability cannot be deployed in Azure if both members of the same HA pool also reside in the same subnet. Each member of an HA pool must be deployed into a different subnet. A virtual hostname (using, for example, Azure DNS) can be used to direct users to the active member of the HA pool. See Azure's help for more information. Create or update network security groups. Open port 5671 (TCP) on the primary and standby servers. SolarWinds recommends that your standby server has similar specifications as the primary server. Create your HA pool using a virtual hostname. Do not use a Virtual IP (VIP) address when enabling High Availability in the cloud. Instead, you must use a virtual hostname. A timeout and error message when attempting to add or view an Azure instance is likely the result of adding two or more virtual machines with the same name, even if they are assigned to different resource groups. The auto-monitoring polling logic expects a unique machine name for each instance in Azure. To resolve, upgrade to SAM 6.6.1 on Orion Platform 2018.2. See this article for full details. If you cannot connect to the main Orion server from your APE or SolarWinds AWS, check that the hosts file includes the main Orion server. If you experience issues and are not on the latest product versions, SolarWinds recommends completing a full upgrade. Use the Orion Installer to create the upgrade path. Many of these updates solve issues you may experience part way through your upgrade. Check our Success Center for troubleshooting. SolarWinds recommends searching on the name of the product, the version number, any error codes or messages displayed, and the general issue you found. Check your Customer Portal for any new hotfixes. If you receive (500) internal server error after an upgrade, use the Orion permission checker to make sure your Group Policy is not locked. See this article for full details. If your views do not load when first opening the console, run the Configuration wizard again. If an issue occurs you need additional help with, contact Support. SolarWinds recommends gathering diagnostics, a screenshot of the issue, and any error codes you receive. Attach and add this information to your ticket. You may also want to gather additional diagnostics on your additional polling engines and web servers.